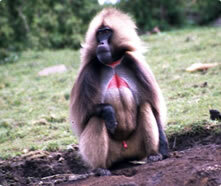 It is common to see troop of Gelada baboons in the Simien Mountains. Found only in Ethiopia’s high country, their ‘sacred heart’ a patch of bare skin on the chest distinguishes them from any other species of baboon. Simien wolf, endemic to Ethiopia, also known as the Simien jackal of Abyssinian wolf, is found in greater numbers in the Bale Mountains then in the Simiens, between 3,000 and 4,500 meters high. 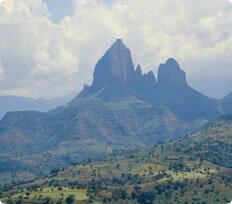 Simien Mountain National Park is the home of the agile Walia Ibex, the symbol of the Ethiopian Wildlife Conservation Organization. Rivaled only by the klipspringer, the Ibex was thought to be heading for extinction, but it appears to be surviving with the protection it is now given.